Sterling Silver, Georgian Baluster Form, Tall Water Pitcher In The Lord Saybrook Pattern. Made By International Silver Co. 20th Century. 4.25 Pint Capacity. Weighs 846 grams = 27.20 troy oz = 29.85 regular ounces. Good clean condition, no monograms or erasures, just needs a good polish. Hand Chased, Figural, Antique Sterling Silver Large Tilting Teapot On Stand With Burner. The Entire Body Of The Pot, As Well As The Stand Are Thoroughly Hand Chased With Scroll & Floral Decoration. One Side With 3 Hand Chased Cherubs, The Other Side Is Crested As Shown In The Pictures With The Motto “BE READY” Beneath. Made By William Clarke Shaw, Edinburgh 1853. All Pieces And Parts Are Hallmarked With The Same Hallmarks. The Set Is Complete With The Chains & Pins. The Crest & Motto Is That Of Baron Lawrence, of the Punjab and of Grateley in the County of Southampton. It was a title in the Peerage of the United Kingdom, created for Sir John Lawrence, 1st Baronet, the former Viceroy of India. The kettle stands 15.25″ high, and weighs 2,154 grams = 69.25 troy oz = 76 regular ounces. Most if not all items are antique or used items, and as such nothing is ‘perfect’, but we always will describe any damage, repair, inscriptions, monograms etc to the best of our ability. Please ask any questions BEFORE purchasing any item. All weights & measurements are approximate, but as accurate as possible. Please view all the pictures as they form part of the description. All items are available to inspect, and pick up, at our Manhattan gallery. We do not ship to PO Boxes. We use Fedex Ground shipping, and a signature is required for delivery. Don’t forget we offer free ground shipping anywhere on mainland USA. We ship worldwide. Please contact us for a shipping quote. English hallmarked, sterling silver tea and coffee service with tilting kettle and tray. Made in London by Lionel Alfred Crichton. The set with applied strapwork. The tray with a reeded border and cast handles. Excellent style, quality and maker. Tray measures 28″ x 17.25″. Tilting kettle is 13.75″ high. Set for 12 people in the Old English pattern. Set consists of the following 12 table spoons approx. 8.5″. 12 table knives (stainless blades) approx. 9.5″ 12 table forks 8″ 12 dessert / cheese knives (stainless blades) approx. 8.5″ 12 dessert / salad forks approx. 7″ 12 dessert spoons approx. 7″ The set is all sterling silver, except for the stainless knife blades. The knives are obviously 20th century, with the stainless blades, the rest of the set is all 19th century, Victorian, of various dates and makers, but all with the same crest of a ‘stag’. There is no crest on the knives. A good, usable, antique sterling silver service, for 12 people. 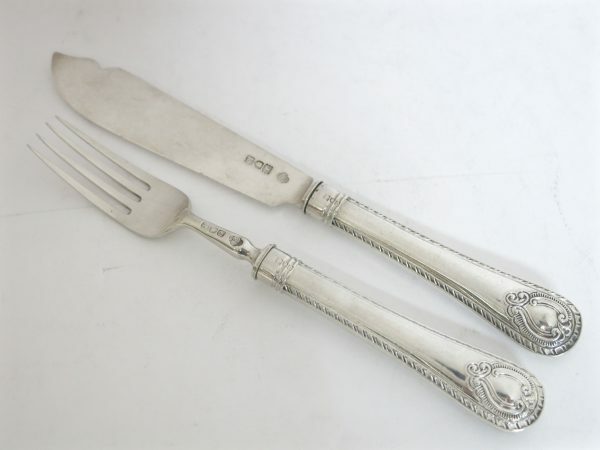 Solid sterling silver set of fish knives & forks, made in London by James Robinson. The handles & the blades are solid silver, not filled or weighted. Knife blades & fork tines have a classic hand engraved thread on the front side edge, and both are hallmarked on the rear. Set comes complete with the original James Robinson anti tarnish bags. Hallmarked London England 1992 -1994. Knife is 9″. Fork is 7.75″. Lord Robert Sterling Silver, 6 Piece Tea & Coffee Set. American sterling silver 6 piece tea & coffee set comprising a water kettle-on-stand, teapot, coffee pot, creamer, covered sugar and waste bowl, together with an associated silver-plate serving tray. Each piece with an italic hand engraved monogramSet weighs 150 ozt 13 dwts (tray not included in weight)Height of water kettle-on-stand 13 3/4 inches. Tiffany & Co. Makers Three-Piece Sterling Silver Breakfast ServicePattern no. 22555, circa 1947-56 Comprising a coffee pot with ebonized wood handle, creamer and an open sugar bowl sugar bowl. Each piece is beautifully hand engraved by Tiffany with a monogram on one side. Height of coffee pot 9 3/8 inches. Sterling Silver Round Footed Salver / Tray With Applied Border & Standing On 3 Cast Feet. Hallmarked On The Underside. Reid & Sons. Dated 1930. 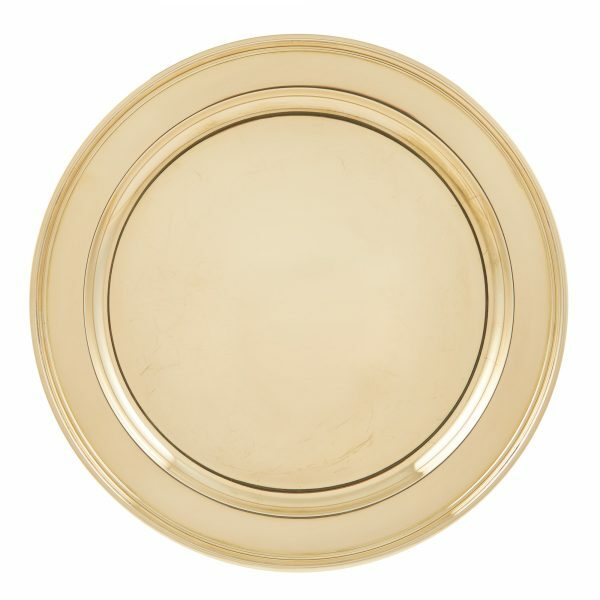 Sterling Silver Round Salver / Tray In A Georgian Style With Applied Gadroon Border, Standing On 3 Cast Feet. Howard & Co, New York, Circa 1900. English Sterling Silver Round Footed Tray / Salver Made By Robert Pringle & Sons, London 1937. The Tray With A Gadroon Border Stands On 4 Ball & Claw Feet, And Is 12.50″ Diameter. Four-piece antique English, George IV, tea and coffee service by the famous Barnard Family of silversmiths. Made in London, hallmarked 1828. The melon shaped body with hand chased floral decoration on a stippled background. The cast spout and feet in a similar manner to match the body. The finials, lids, handles and body are all correctly hallmarked and all original. Great quality set, by an excellent silversmith. Great style & highly serviceable as well as decorative when not in use. The coffee pot stands 9.25″ high Made by Edward Barnards & Sons., Edward Jr., John & William. 12 Antique sterling silver dessert plates made by Black, Starr & Frost, circa 1900. Each with a cast border and hand chased and pierced decoration, centred by a beautiful hand engraved monogram. Each plate is marked on the underside with the Sterling Mark and The Black Starr & Frost Mark In use from 1874 – 1908, as well as The Black, Starr & Frost Eagle Mark. Plates are just over 7″ diameter. 3220 grams. Italian, sterling silver, hand-hammered wine or champagne cooler / ice bucket. Measures: 11.50″ tall, Diameter of rim 9″, Width over handles is 10.25″. Stunning and exceptional quality, antique sterling silver cast and pierced border tray. Made by Shreve & Co. in San Francisco, circa 1910. The border is beautifully cast and pierced and the centre of the tray has hand engraved decoration to match. Great as a bar tray, serving tray, coffee tray, fruit or food platter. A multitude of uses and also very decorative when not in use as a centrepiece. Tray measures 30.65″ x 17.50″ x 1.75″ high. Tray weighs 4865 grams. A Complete Service For 12 People In The Georgian Style, Old English Pattern. A Timeless Pattern That Compliments Almost Any Style Of Table. Georgian To Modern. The Set Consists Of The Following 12 Table Spoons 8.5″ 12 Table Knives 10.75″ 12 Table Forks 7 7/8″ 12 Round Bowl Soup Spoons 7 7/8″ 12 Cheese / Dessert Knives 9.5″ 12 Dessert Spoons 6.75″ 12 Dessert / Salad Forks 7 7/8″ 12 Tea Spoons 5.5″ 12 Coffee / Demi Tasse Spoons 4.5″ 6 Egg Spoons 4 1/16″ 2 Gravy Ladles 7″ 1 Stuffing / Basting / Serving Spoon 12″ 1 Soup / Punch Ladle 13.25″ 1 Chutney / Olive Spoon 8″ Everything is sterling silver, English hallmarked, except the blades on the knives which are stainless. The spoons, forks & serving pieces were all made by Goldsmiths & Silver Company, hallmark for London 1921. The knives were made by L.A. Crichton, and hallmarked London 1910, and the old steel blades have been replaced with stainless blades. Each piece is crested on the front with an upstanding goat, except for the knives which are blank A great set, great pattern, very good maker, very good condition. Chased grape and vine, Victorian, sterling silver gilt, grape shears made by Mappin & Webb, dated 1892. 6.75″ long. The scissors are all silver and fully hallmarked. Set of four English, sterling silver gilt, dolphin and shell master salts, made by Richard Comyns, London, 1962. The cast dolphin and shells are beautifully textured and are solid silver. Each Is Hallmarked. Measure: 4″ high. Total weight 1700 grams. From the estate of Zsa Zsa Gabor, Bel Air, California. An absolutely stunning and rare sterling silver Neff. Superb quality and detail, and an unusual size. This three masted neff is fully manned and rigged with sailors, the deck detachable, the hull with putti riding dolphins and numerous fish and dolphins among chased waves and applied with a mask at the bow. Also Unusual to be made and hallmarked in England, as they were often German made in 800 silver. This neff is solid sterling silver, and is English hallmarked throughout. Made in London by Pairpoint Brothers In 1923. Stands at 26″ tall x 24″ in length. Neff (originally spelt nef) was an ornamental model ship, galleon, usually made in silver, silver-gilt or gold, and made specially for the dinner table. They were often quite elaborate with masts, sails, rigging and various figures on board. Early examples (13th-16th century) were drinking cups or receptacles for dining implements. Neff’s originated from the continent and were used in France, Germany, Spain and Italy but most neff’s found today were made in Germany at the end of the 19th century. Traditionally the neff was made in two sections and the top half was removable so that the hollow hull could be used to contain the spoon, knife, napkin, spices of the host. Later neffs were fashioned to hold wine, sweetmeats or a variety of special condiments. Sometimes the nef had wheels, so they could be rolled from one end of the table to the other. Messrs. PAIRPOINT BROTHERSSilversmiths. 80a Dean Street, Soho LondonThe grandfather of the present proprietors of the business was William Pairpoint, the celebrated water-gilder, who was well-known at the beginning of the present century. That branch of the business is still carried on, under the name of W. Pairpoint and Sons, in Gerrard Street. Mr. Edward Pairpoint, the father of the brothers Pairpoint, who had been apprenticed to one of Lambert’s subsidiary houses, began business in 1848. Of the place occupied by the four brothers Pairpoint in the silver world little is necessary to be said, for their silver mark JP over FP, may be seen in every retail silver merchant’s window in London. It is admitted on all sides by experts, sometimes with a sigh of regret, sometimes with a grin of malice, that ” Pairpoint ” copies of ancient patterns are dangerously near being indistinguishable from the originals, whilst their new manufactures carry one back to the days when the master silversmiths employed the first artists of the day to assist them in their productions ” devised in love and fashioned cunningly.” The firm is principally known to the trade as manufacturers of large and important works, such as centerpieces, presentation vases, and the like. To the amateur of antique silver and Sheffield plate, whether he be in Europe or America, the name of Pairpoint is a household word, and the quantity of antique plate and old ” Sheffield ” that has passed through the hands of the firm since the renaissance of 1874 is little short of fabulous. Antique English, Sterling Silver Serving, Basting or Stuffing Spoon In The Every Popular Kings Pattern. Made In London By Joseph & Albert Savory, Dated 1844. Spoon Measures 11.75″ Long, And Weighs 170 grams. The Front Of The Spoon Has 3 Superimposed Hand Engraved Initials. We Have A Huge Selection Of English Flatware Pieces To Complete Your Antique Set. We Sell Single Pieces Or Entire Sets & Well As Knives. Check Our Web page For A Small Selection, Or Feel Free To Visit Our Manhattan Gallery To See Our Entire Inventory. All items are antique or used items, and as such nothing is ‘perfect’, but we always will describe any damage, repair, inscriptions, monograms etc to the best of our ability. Please ask any questions BEFORE purchasing any item. Please check all the pictures, as they are part of the description. All weights & measurements are approximate, but as accurate as possible. All items are available to inspect, and pick up, at our Manhattan gallery. English hallmarked, sterling silver golf trophy, presented by the Kebo Valley Golf Club, the oldest golf club in Maine, and the 8th oldest club in America, founded 1n 1888. This trophy was made in England in 1936 by Barker Bros, and presented to John W. Grange by DeForest Grant in 1938. Championship Putting Contest. Trophy is approx 4.5″ high. Very good condition. Inscription is clear, as are the hallmarks. This Is Just 1 Item From Our Huge & Varied Collection Of Sterling Silver For Sale. Check Our Web page For A Small Selection, Or Feel Free To Visit Our Manhattan Gallery To See Our Entire Inventory. All items are antique or used items, and as such nothing is ‘perfect’, but we always will describe any damage, repair, inscriptions, monograms etc to the best of our ability. Please ask any questions BEFORE purchasing. Please check all the pictures, as they are part of the description. All weights & measurements are approximate, but as accurate as possible. All items are available to inspect, and pick up, at our Manhattan gallery. Free Ground Shipping On Mainland USA. English, Sterling Silver Serving, Basting or Stuffing Spoon In The Queen Anne or Rattail Pattern. Made By Cooper Brothers & Sons, Dated 1948. 11.25″ Long. Weighs 147.50 grams. No Monograms Or Initials. A Good Quality Pair Of Serving Spoons Made In Vienna, Austria, Circa 1930’s. Measure Approx. 9.65″ Long. The Pair Weigh 258 grams. Both Have Beautiful Deco Engraved Initials On The Rear. 800 silver. Hallmarks Are On The Bowl.